NACS has implemented a number of new features and services related to the public PC and Macintosh computer labs NACS supports, including some labs managed in cooperation with other UCI departments. The ArtsTEC Mac Lab in the Claire Trevor School of the Arts has been upgraded with 23 new dual-CPU Apple G5s with 1GB of memory and 160GB disk drives running OS X. Video Art students will once again have access to high-speed external (portable) Western Digital hard drives for spring quarter. The MSTB Lab A (MSTB 210) 46-workstation lab has been upgraded to all-in-one computers with integrated 19″ LCD displays, 3 GHz Pentium-4 CPUs, 1GB of memory, and 160GB disk drives. Both MST Labs (A and B) are available for any UCI courses or for drop-in use when not scheduled for classes. 21 computers in the NACS Engineering Gateway Lab B were upgraded to Compaq 1.7 GHz Pentium-4 systems. The Instructional Technology Center (ITC) Lab A and Lab B have been upgraded with all-in-one computers with 1Ghz Pentium-3 systems. 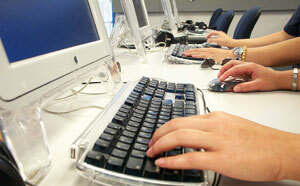 The Library – Gateway Study Center 25-workstation Lab has been expanded to 50 workstations. 25 more SmartClassrooms have been installed, bringing the total to around 60. In addition to the SmartClassroom media equipment, the newest rooms feature new Dell GX270 2.8GHz Pentium-4 systems with 512MB of memory and 17-inch LCD monitors. Smartclassroom systems are configured according to campus lab standards. The ArtsTEC Lab is a new computer-equipped classroom developed and maintained by the Claire Trevor School of the Arts and NACS. Located at AITR 190 (building number 714 on the campus map), ArtsTEC is available for all regularly-scheduled UCI classes. ArtsTEC is equipped with a video projector, a DVD/VHS player, and 23 Macintoshes with Microsoft Office as well as applications such as Final Cut Pro, Photoshop and Illustrator. ArtsTEC is particularly well suited for the digital arts curriculum. The public lab (“Lab A”) in Engineering Gateway which offers similar systems is about to be retired. For equipment specs or complete list of installed s/w, please see http://www.nacs.uci.edu/computing/labs/artstec190-details.html . If you have any questions, please contact NACS. An Open House will be held in Rooms 210 and 226 of the Multi-Purpose Science & Technology Building on Wednesday, March 26, from 12:00 noon to 2:00p.m. This event is being co-sponsored by NACS and Gateway Computers and will highlight the NACS MST computer lab. Free food and beverages will be available at this event. There are many times when it would be convenient to conduct a small workshop or seminar in a computer-equipped facility, but such rooms are few at UCI, and most are configured for larger numbers of participants. Recognizing this, NACS acquired and implemented a “Mobile Computing Lab” (MCL). The MCL consists of 16 laptop computers equipped with wired and wireless networking capability. Now workshops and seminars which would benefit from computers require only an available room. The NACS Mobile Computing Lab comprises 16 IBM Thinkpad a22m laptop computers, with 256MB memory, 20GB disks, CD, DVD, and floppy disk drives, 15″ screens, and 850MHz Pentium III CPUs. Also included are wireless ethernet (802.11b) PC cards, a 100 megabit/second hub, and a high-resolution LCD projector, all of which can be readily transported to any building and any room on the main campus. With as little as a week’s notice, if the laptops are not already booked, a Windows 2000 or Windows XP configuration will be copied onto the systems, along with the majority of popular academic and productivity applications. With more time, any application needed can be licensed and installed as well. The MCL has been successfully used many times, for uses ranging from Microsoft Office or CorporateTime training, to EEE seminars, through Windows XP system administration training. If you have a room, NACS can help you make it into a computer lab. NACS maintains six computer labs for campus use, and we have upgraded many of our systems to meet the demands of a new academic year. The 25 Macintosh systems in Lab A (Engineering Gateway 1131) have been upgraded to 533Mhz G4 Towers with 15″ flat-panel displays and CD-RW drives. The 46 computers in MSTB 210 have been upgraded to Gateway “Profile 3″ PCs featuring 1Ghz Intel Celeron processors, 512MB memory, and 15” flat-panel displays. The 733Mhz PCs which were used in this lab last year are now available in Lab C (Engineering Gateway 1151). All of Knack’s PC labs now run Windows 2000 Professional and require a login process using UCInetIDs and passwords. It is necessary to activate one’s UCInetID before using these facilities. (See http://www.activate.uci.edu).